Editor’s note: This is the eleventh installment in a series of dispatches from the Rath family (Colin & Pam, daughters Breana, Meriel and Nerina), who departed Stamford, CT in the fall of 2014 for a worldwide cruise aboard their Hanse 545 Persevere. Sailing up to Gibraltar, you begin to understand why the Spanish were never able to throw the Brits out. It’s a bloody big rock that has unparalleled height advantage for miles. The only chance you would have would be to starve them out with a blockade (which the Spanish almost did), but the British eventually changed that scenario with their overpowering navy. The other initial observation is that it’s a tiny peninsula, cut off from Spain with the airport as its border at the base of the peninsula. The border is only open when flights are not scheduled, and you actually drive across the runway to get into and out of Gibraltar. Sometimes you can wait for an hour to cross because of air traffic. This diminutive country has less than 40,000 citizens and everyone knows each other. Checking out in the local grocer takes hours because everyone is busy socializing. We visited in October, so the start of the holiday season only multiplied the camaraderie of the locals. The supermarket had a bar across from check out that seemed to be the local tavern for many while their spouse shopped. Gibraltar is distinctive also in the way they incorporated the historic fortifications into its urban landscape. The town is built within a solid rock fort, several meters thick. To get from any marina or shore, you only have access through the original gates for the fort, so there are only seven to ten access points to main street in town. It’s kind of fun also, they took a munitions dump and made a great social club for the town within the fortifications with ice skating rink, bowling alley, movie cinema and restaurant. The kids enjoyed it because we could see movies in English in the cinema. Spectre and Star Wars were both must-sees. The actual Rock of Gibraltar is a national park. 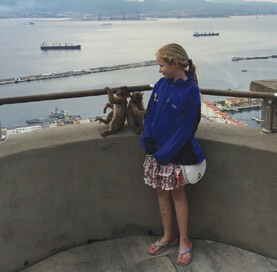 You can walk/climb up or take a tram to the top, and the place is crawling with monkeys. There are tunnel fortifications from the 1800s and World War II and a great natural cavern made into a concert hall within the rock – absolutely beautiful. The girls loved the monkeys crawling all over them and being playful. The climbing provided much needed exercise for the crew. After seeing all the sights and learning the history, it was time to provision for departure. The other good thing about Gibraltar is that it is outside the EU, which means there’s no Value Added Tax “VAT”(there’s a 23% VAT on everything in Europe). The main street is full of stores selling electronics, liquor and luxury items…ideal for Christmas shopping to begin. 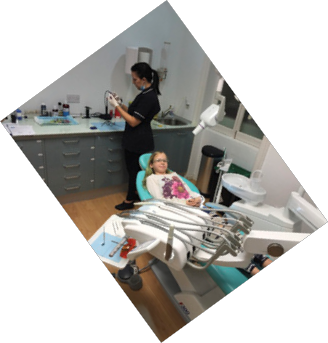 We have been abroad now for over a year and it was time to do dental and medical checkups with the crew. Here is where the real medical savings are. We had all three kids’ teeth cleaned with x-rays from a dentist that studied in Oxford, who also filled three cavities on two of the girls for 200 pounds. All done. You can imagine what that would be back in the states. Our old dentist that I’ve been seeing since I was 10 and who has done my entire family for years charges $530 for cleaning and x-rays, and cavities ranged from $500 to $1,000 depending on what needed to be done. I usually ended up paying about $1,000 for three girls’ cleaning at the end of the billing paper chase between insurance and dentist and me, about three months later. This was clean, work done, cash, thank you. Which would you rather have? I know I have talked about this before, but medical insurance in Europe is not a major part of the family budget. Now, you can say the USA has the best medical service in the world, and I don’t disagree. I just think that for everyday simple preventive care and minor medical problems you need to take the insurance industry out of the equation. Anyway, I digress. We had clean teeth and clean bills of health. After provisioning and fueling up, we departed for Valencia, Spain. We arrived in the Marina in Port de Valencia just in time for Halloween. The girls had finished up their first year home schooling and all got great grades and accreditation from the school to move forward to the next grade. Pam did a great job teaching, and we were happy with the hard work the girls put in. Increasingly, European countries are catching on to the commercialism of the holidays like Halloween, Christmas and Easter, and the girls wanted to do something for Halloween. Valencia has a traditional zombie walk that caught our eye. They had makeup artists make over 600 zombies that meet at the main square in town and walk throughout the city as zombies. People came in costume, groups of zombie Flamenco dancers and everyone got into character as they wandered around the city en masse. It was a lot of fun. The girls liked playing the games the event set up at the staging point while everyone got made up. They won tickets that could be traded in for prizes. Good clean zombie fun. There was also a zombie race in the marina that night at midnight with bands at the finish. Not quite trick or treat, but Halloween fun nevertheless. 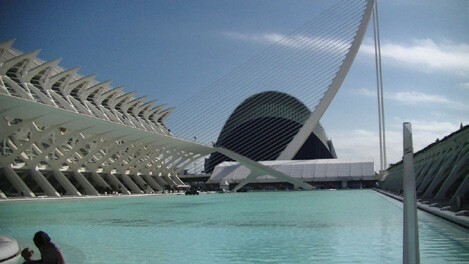 Valencia filled in the old riverbed of Turia that circles the city and made an amazing park, complete with a giant statue of Gulliver transformed into a children’s playground with slides and tunnels. A favorite with the twins. The City of Arts & Science, designed by Santiago Calatrava, who is also the designer of the new train station at Ground Zero in Manhattan, is next to the park. The park is full of unbelievable buildings that defy gravity, like the Museo de las Ciencias Principe Felipe. This amazing building was the set of the future in Tomorrowland, the Disney movie with George Clooney. Forget the architecture being magnificent, the whole place is tiled. The white and blue on the domes are small individual tiles broken to achieve the complex curve. Imagine the artistry to do such a building and the time it took. We enjoyed riding our bikes around old town and the open market where they sell fresh produce, fish and meat. There were small restaurants tucked away in the corner of the market where you could try local dishes. It was a lot of fun exploring with the family. After a few weeks there, we set sail for Barcelona to see firsthand the Gaudí architecture that we’d heard so much about. Look for updates on Persevere’s journey in future issues of WindCheck, and track their progress on their Facebook page. Colin’s book, It Is What It Is, can be purchased at any major bookstore or online at Amazon & Barnes & Noble, etc. You’ll find pertinent links at ColinRath.com.